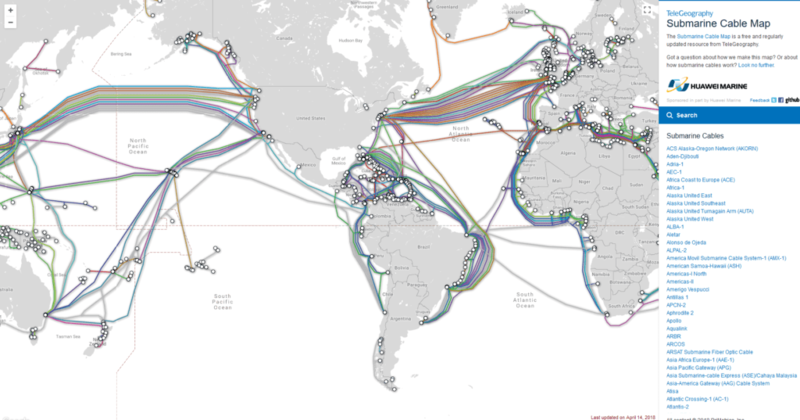 I was browsing the web and came across this awesome map of submarines cable that make up the internet backbone. This is how and why we live in a connected world. You are from the UK and want to access google.com what happens? From the wireless router in your home you request google.com, the request is then sent through BT Telephone Network (UK Telecom’s Provider) to your local telephone exchange and onward to the backbone of the Internet. Looking at the map below you can see the submarines cables connecting the world in our case one of the submarine cables to America would be used. Once the requests reaches America it uses local telecom’s companies to route the signal to google servers. Google receives this request and sends the google page back across the Atlantic to the UK and to your home. Below is a Traceroute from the UK to google. Each IP address is a server that has passed my request to google. A server is basically a physical computer so in this case it took 7 computers in different locations to pass my request to google requesting the google webpage.